A Winter Storm Watch and Winter Storm Warning have been issued for Saturday for NJ's southern coast, with another chance of snow in the forecast. Will it be "no big deal" or significant? As we wrap up one (minor) snowstorm, it's about time to look ahead to the next one. And that next chance for wintry weather is less than 24 hours away, during the daytime hours on Saturday. As of this writing, I'm pleased that the magnitude of our early morning snow stayed mostly close to our forecast. The highest snow total reported by the National Weather Service so far: 2.5 inches at Gloucester City, Gloucester County. As expected, we saw a solid inch or two of snowfall along the NJ Turnpike corridor. Monmouth and Ocean counties seemed to have been spared from those higher 2-3" totals, thanks to a dry slot that prevented snow from falling for much of the overnight. Snow showers taper off completely by about 8 a.m. Skies will only clear marginally through Friday afternoon, with high clouds obscuring the sun all day. High temperatures are forecast to reach the mid 30s. Above freezing for most of the state, but not by much - the snow that fell will be on the ground for a while. Thanks to cold air, light winds, and snowpack, tonight is going to be quite cold. Lows should dip into the upper teens to lower 20s by Saturday morning. SETUP: I channeled Aerosmith in headlining this post, because New Jersey is going to end up right on the edge of a powerful coastal storm system this weekend. That system will bring 10+ inches of snow to part of Virginia and North Carolina, before making a left turn up the Atlantic coastline. I'm now confident we're going to see a least some snow, especially along the south coast. How close the system hugs the coastline will directly impact whether this storm becomes mostly a non-issue... or not. TIMING: There's pretty good consensus that snowfall will occur between 4 a.m. and 6 p.m. Saturday. The heaviest period of snow will be from mid-morning through mid-afternoon Saturday. MODELS: This storm has been incredibly difficult to get a handle on, as forecast models have wavered back and forth between a southeast (out-to-sea or "miss") track and a northwest (glancing blow or "hit") track. I've seen statewide snowfall numbers literally ranging from 0 to 16 inches over the past few days. Calm down - I think we can safely throw out the highest forecasts. (Even though the 4km NAM model admittedly still depicts a direct hit track, it is a clear outlier among the morning model suite.) Among the other models, the NAM and Euro have emerged as the snowiest and the GFS has always shown a less snowy solution. --Sussex/Warren counties: Hardly anything. If snow showers do make it this far north, only a half-inch to an inch will accumulate, at the most. --North of the Raritan River (i.e. the southern portion of I-287): If a steady snow band happens to move through this region, a quick "few inches" of snow will be possible: between 1 and 4 inches. 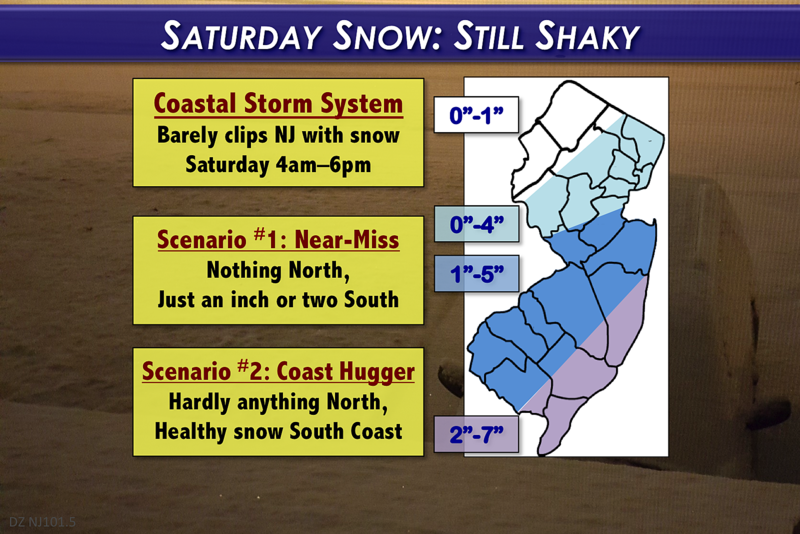 It is also certainly possible that North Jersey receives no fresh snow from this system. --Central and South Jersey, away from the coast: Depending on which track scenario plays out, between 1 and 5 inches of fresh snow will be possible. --Southern Ocean, SE Burlington, Atlantic, and Cape May counties: Certainly the bullseye for snow accumulation, as this area ends up closest to the center (strongest part) of the storm system. Our latest forecast calls for anywhere from 2 to 7 inches here. CONFIDENCE: I fully recognize that there is a huge difference between the preparations and impacts required for a 2-inch snow versus a 7-inch snow! Please keep in mind that the snowfall forecast ranges I've presented here are wide on purpose. (In scientific terms, "accuracy" is way more important than "precision".) The polar opposite scenarios are necessary, given the continuing uncertainty surrounding the forecast track and subsequent snow totals. Prepare for the worst, hope for the best. (Your definition of "best" might depend on how much you like snow!) Expect a generally wintry day Saturday, especially the further south and east you are. The deep freeze continues as temperatures literally remain below freezing all weekend long. Highs will be limited to the mid 20s on Saturday and Sunday, with lower 30s on Monday. Low temperatures will probably dip well into the teens for both Sunday and Monday mornings. Long-range forecasts show a warmup back to the 50s (at least) by midweek next week, but that's a low confidence forecast at this time.